A whimsical yet cool and classic cushion. 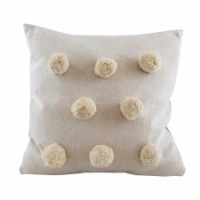 Off white cushion measuring 45x45cm with 8 large cream pom poms on the front. Removable cover, comes with a feather inner. This unique cushion adds a novel twist to any room.